Biberach is a town in the south of Germany, Biberach district capital in the free state (Land) of Baden-Württemberg. To distinguish it from the other Biberachs it is called Biberach an der Riß after the small river Riß which flows through the city. The marketplace with its patrician buildings, its fountain and its renovated town hall is one of the loveliest in the south of Germany. With a rather low unemployment rate of around 3.6% and place of business of companies like EnBW, Handtmann, Liebherr, KaVo Dental GmbH, and Boehringer Ingelheim, Biberach is a significant industrial location in the southwest of Germany. For many centuries, Biberach was an Imperial Free City (German: Freie Reichsstadt) in the Holy Roman Empire. In that role it participated in the 1792 Reichstag. During the Protestant Reformation, Biberach was notable for being - eventually along only with Ravensburg, Augsburg and Dinkelsbühl - a Mixed Imperial City (German: Paritätische Reichsstadt) where the Peace of Westphalia caused the establishment of a joint Catholic–Protestant government and administrative system, with equality offices (German: Gleichberechtigung) and a precise and equal distribution between Catholic and Protestant civic officials. This status ended in 1803, when Biberach was annexed by the Margraviate of Baden, soon to become a grand-duchy. In 1806, it was traded with the Kingdom of Württemberg in exchange for the town of Villingen; becoming part of the German Empire on its creation in 1871. During World War II, two large prisoner-of-war camps were located here, with Oflag V-B for officers, and internment camp Ilag V-B for allied civilians, mainly from the Channel Islands. “Filmfest Biberach” is a film festival celebrating German films and has been running for over 30 years. Since 2004 Biberach has also had a second festival, the Biberach Independent Film Festival that focuses on experimental shorts and documentaries. 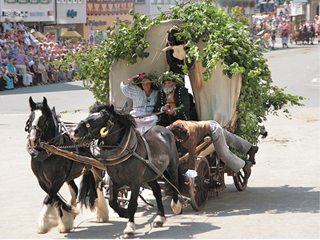 The Biberacher Schützenfest is an historic festival for children and the town. The event starts every year in the first week of July and lasts nine days. The name “Schützenfest” derives from the German noun Schütze, meaning marksman. But nowadays, the crossbow competition and the appraisal of the best male and female champion shot (Schützenkönig and -königin), are only small events during the week of the Schützenfest. 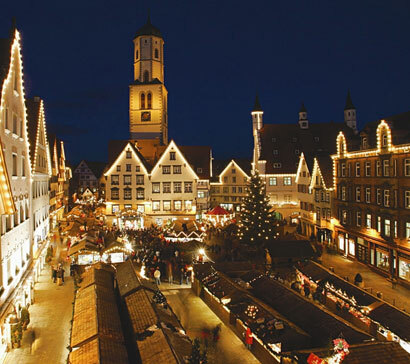 The annual Christmas market, called “Christkindlesmarkt”, which lasts 16 days, is another highlight of the year. Exotic foods from Britain, France, and Italy (presented by the twin cities), kitsch, and beautiful arts and crafts are there to see and buy. People meet to drink mulled wine and eat “Knabberfleisch” (small breaded pieces of pork eaten with a small wooden fork). View a live webcam of the Chrismas Market. The total area of Biberach an der Riß is approximately 28 square miles (74 km2) and it is situated in the south of Germany in the Biberach region. The population is just over 32,000.